This year, we are focusing on expanding our network of house museums in Latin America. This month, we report on our working visit to Mexico City. We walked in the footsteps of Luis Barragàn, Frida Kahlo, Diego Rivera and Juan O'Gorman – and discovered the imaginative organic architecture of Javier Senosiain. Our Icon at Risk is O'Gorman's Conlon Nancarrow House-Studio. Welcome House-Studio Museum of Diego Rivera and Frida Kahlo! The House-Studio of Diego Rivera and Frida Kahlo is one of the most important cultural landmarks of Mexico City, both as the place of residence and studio of two of the most important Mexican artists of the 20th century, and as the first building of the Modern movement on the Latin American continent. Juan O'Gorman, a friend of Diego Rivera, was the architect. Frida Kahlo’s life and art were rooted in Casa Azul, the Blue House, in the southwestern suburb of Mexico City, Coyoacan. She was born and died there, living only relatively briefly in the house and studio she shared with Diego Rivera. Her intimate universe is revealed in Casa Azul through her personal belongings, her collection of Mexican folk art and many of her exhibited artworks. North of Mexico City, on a hill at Vista del Valle, sits architect Javier Senosiain's private house overlooking the city, which he designed in the shape of a shark. Its interior features a complex labyrinth of rooms and interconnecting carpeted tunnels. The organic house was born from the idea of creating a home adapted for human environmental, physical and psychological needs. Adriana Sandoval makes an eloquent case for the importance of Juan O’Gorman’s last building – now at a critical juncture in its history – in the architectural and cultural heritage of Latin America. Once home to the important 20th-century composer Nancarrow, the Conlon Nancarrow House-Studio is currently in a period of transition. The family is trying to find someone to take on and preserve the house for the future. 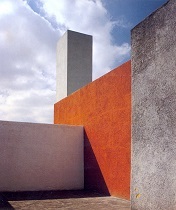 In Mexico City, a strong emphasis was obviously on the impressive houses designed by legendary Mexican architect Luis Barragán (1902-1988), who won the Pritzker Prize in 1980 and whose own house and studio were listed as a World Heritage Site in 2004. More images can be found in our listing and a few other Barragán houses, Cuadra San Cristóbal and Casa Gilardi, are described in our Mexico report. Welcome Nanne de Ru of Powerhouse Company as a Friend of Iconic Houses! Since its first commission (a villa named Villa 1), Powerhouse Company has designed and built many private houses. De Ru is an avid visitor of iconic homes and considers villas one of the most interesting design commissions for an architect. He also tells us that all exceptional houses are commissioned by exceptional clients.